My husband’s great great great grandparents were Thomas Edwards (1794-1871) and Mary née Gilbart (1805-1867) from St Erth in Cornwall. They were married on 14 March 1826 in the parish church St Erth. Thomas and Mary’s oldest son Thomas was baptised at St Erth on 27 August 1826. On the 1841 census Thomas was a carpenter living with his wife Mary and five children at Bridge Terrace St Erth. The youngest of the nine children of Thomas and Mary, Francis Gilbart Edwards, was born 21 January 1848 at St Erth, he was christened at the parish church. Shortly after the birth of Francis, the family emigrated to Victoria, sailing on the Lysander from Plymouth on 21 September 1848 and arriving at Port Phillip on 13 January 1849. In 1837 Mary’s sister Sarah (1808-1854) had married Francis Tuckfield (1808-1865) who was a Methodist missionary to the Aborigines at Buntingdale near Geelong. The Tuckfields had been in the colony since 1838. The older children could both read and write, William and Benjamin could read. One child, Francis, had died at the age of 3 in St Erth in 1844. On arrival it seems there was some difficulty with the immigration of passengers from the Lysander. 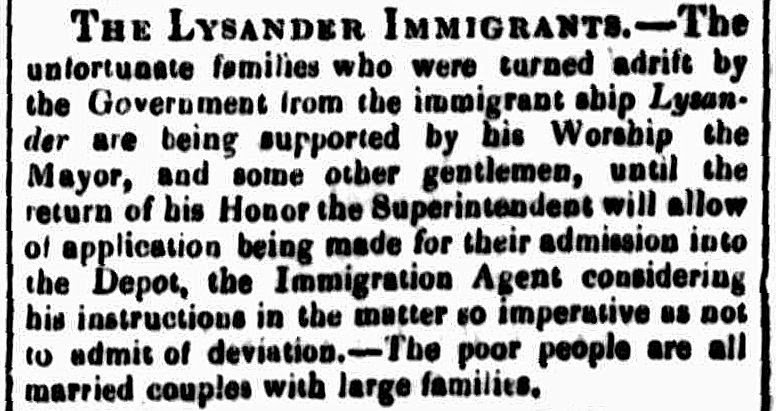 At the time of the arrival the Lysander, La Trobe was meeting with the people of the Portland district. The Launceston Examiner on the 14th of February gives us a little more information. 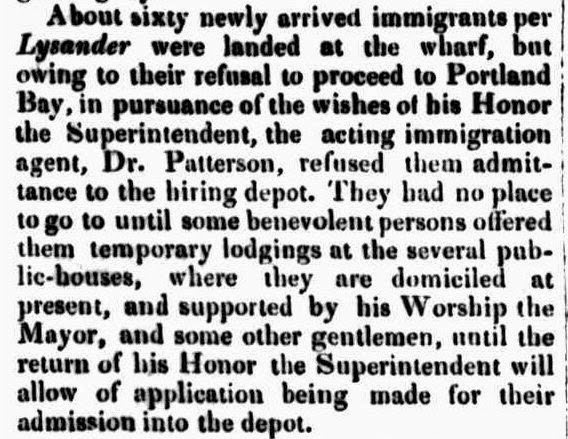 The Superintendant of the Port Phillip District, Charles La Trobe, wanted the immigrants to proceed to Portland but they were refusing to do so. An article in The Cornwall Chronicle (Launceston, Tas. : 1835 – 1880), Saturday 17 February 1849, page 377 goes into further detail. The project of sending a shipment of the recently arrived immigrants to Portland has been abandoned, the number willing to proceed to that port being found insufficient to warrant the chartering of a vessel for the purpose. responsible for administering immigration in conjunction with the British Emigration Agent in London who supervised the selection of applicants and arranged for their passage. The Superintendent’s responsibilities included local administration of Government funded assisted immigration schemes, reception and initial settlement of immigrants as well as monitoring immigrant arrivals, including inspection of ships, certification of passenger lists, and regulating alien immigration. Locally appointed Immigration Agents assisted the Superintendent with many of these responsibilities. I assume the Edwards family may not have been caught up in this immigration delay as they already had connections in the colony.